This is a mod that will add the option to play poses and animations in game. It adds an interaction to your sims called Pose By Name and Pose By Pack. Just click on your sim like you would to do anything else. When you choose the Pose By Name option, you can enter the name of the animation (I have attached a text file below with all EA in-game animation names below) and your sim will do that animation until you cancel the interaction. You can use it on your sim or any other sim even if it is not part of your sim's household. To stop a sim from posing, just click them again and you will have an option to stop the pose. 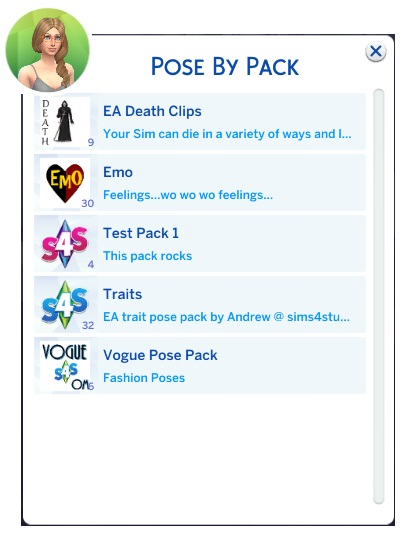 There are many more pose packs available at this site in the Creator Studios and other sites . Download a full list of in-game animations HERE. Thanks to orangemittens , samanthagump , inabadromance, and brujah for testing. This mod will allow you to play any effect from the game and you can select from a list of over 6000 effects. After starting an effect, you can stop it by clicking it again. You will also have the option to replay it. Once you have mastered the use of one effect player... buy some more. Hide Others - This will hide all effect players except the one that you have clicked. This is particularly useful when taking screenshots or making videos where you don't want the effect player to show but you do want the effect. Show All - After hiding them, you may need to un-hide them so you can move them and/or delete some of them. Stop All - This will stop all effects. Replay All - This will restart all effects that you have placed. It is useful not only if you have stopped them, but also for effects that do not loop like explosions. Use the bb.moveobjects cheat code and you can use Ctrl+9/Ctrl+0 to move them up and down. If working with large effects, you may want to use EA's cheat to enlarge the effect player with the '[' key while placing it. Effects placed will be saved with your game. If you hide all effect players and delete the one that is not hidden, simply buy a new one to get the menu back. This will wait 5 seconds before playing, repeat every 1.5 seconds and only play 10 times. You don't have to use the extra options, and if you do use one, you don't have to use them all if you don't need them. They also do not need to be in any specific order except that the effect code should be first. The video above by bakie shows in detail how to use the Studio Effect Player, some tips on how to use it more effectively and how to use the new options in this updated version. Thanks again to bakie for the ideas for the new options, helping me test it and making this great video on how to use it. This mod adds new tuning and animations to EA's "Dear Old Grandfather Clock" to make the pendulum animate. You can click on the clock to turn off the animation or turn it back on. This pose pack adds all adult traits from CAS to the pose player. This mod, created by scumbumbo , allows you to summon or teleport any sim. It is very useful mod often used in conjunction with the pose player. It was completely broken by the 03/23/2017 patch, although some of its features were broken in earlier patches. I have updated it to work with the latest patch and fixed several errors related to this patch and earlier patches. 1. Unzip the 2 files and place them in your mods folder. 2. 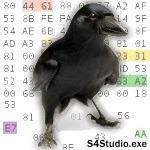 Delete any old versions of the .ts4script and .package. 3. Patch your game to the latest EA patch. 4. If you have placed the .package and .ts4script in a sub-folder, try moving them to your main Mods folder. This has helped some people that could not get it to work. 5. Take everything out of your mods folder except the teleport package and ts4script file. If it works this way, you may have a conflict or have not fully removed all other versions. You may want to use a mod conflict detector to help find the conflicting package. Buy the teleport statue and place it where you want your sim to teleport. If the sim is not in the area, use the summon option to bring them there. If the sim is on the lot, use the teleport option. The sim will appear in place of the statue. When you want a summoned sim to leave, click on them and choose "Just go away" and they will disappear. sweetsorrowsims has a helpful video demonstrating how to use this mod with the pose player HERE. This mod enables custom content craftable items in the in-game menus. Craftable items include things like food, drinks, paintings, woodworking sculptures, and more! It will work with any craftable item made to work with the crafting enabler. This new system does not require updates to the script in order to add new craftables. That means that people using it do not have to re-download the script each time someone makes a new craftable item. It also means that creators do not need to ask permission to create new craftables or join a group. Also, check out Leniad's custom food and woodworking menus that sort CC food and wood craftables into categories! If you would like to create custom craftables, check out this post to see how to how to make your new craftable item. - Fixed an issue in version 1.2 that caused new menus (like the Grab A Drink in AOM Studio) to not work anymore. - Adds support for the Get Famous patch. - Adds support for adding new crafting menus to crafting objects without overriding the object's tuning. - Enables adding recipes and paintings to existing crafting menus. This pose pack adds all toddler traits from CAS to the pose player. 1. Watch Bugs Get Zapped - Sims will watch the bugs get zapped and gain fun. They can be sitting, eating, or drinking while they do this as long as they are close enough to it. 2. Touch - Your Sim will walk up to the bug zapper and touch it. Doing so will electrocute them. As with any other electrocution in this game, be warned, that if you do it too frequently, your Sim will die of electrocution. This interaction has custom animations. Amped Up! - When a Sim with the Bro trait touches the bug zapper, they will have their energy bar maxed and get the Amped Up buff that makes them feel energized. Non-Bro Sims will have their energy drained and will faint. Zapped! - All Sims that touch the bug zapper will get the Zapped! buff that makes them feel very uncomfortable. Flies will swarm around the bug zapper. When you turn it on, you will hear them getting zapped and see sparks. This mod enables custom accessories like the umbrellas in Seasons to be used without overriding lots of tuning files. 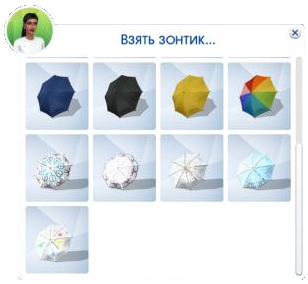 Right now it only works for the new umbrellas, but in the future it could be extended to other things like the cell phone covers that came in a game patch. The next version of Studio will add the resources needed to work with this mod automatically. To use this mod, you will need to unzip the files in the download and place both of them in your Mods folder. You will need to make sure that script mods are enabled in your game, and also have a custom umbrella package in your mods folder like the one linked below. Note: the menu will be in your game language.